President Nixon and Soviet Premier Leonid Brezhnev sign the AMB Treaty and interim Strategic Arms Limitation Agreement in Moscow on May 26, 1972. On this edition of the Nixon Now Podcast, we’re talking the Nixon Tapes again, with specific focus on President Nixon’s conversations about diplomacy with leaders of the Soviet Union. Our guest is Luke Nichter, Professor of History at Texas A&M, Central Texas. He’s the nation’s foremost expert on the Nixon White House Tapes, and founder of NixonTapes.org. – What were American and Soviet leaders trying to achieve with Strategic Arms Limitation Talks (SALT) and detente? – How does the Soviet policy of detente reconcile with the Brezhnev doctrine? – What concessions did Nixon and Kissinger want to attain from the Soviet Union? – How did domestic political considerations in the United States and the Soviet Union impact relations between the two countries? Conversation Oval 487-021. 23 April 1971. 2:52pm-3:36pm. Haldeman, H.R. ; Kissinger, Henry; Nixon, Richard. Conversation Oval 534-013. 10 May 1971. 12:57pm-1:30pm.. Kissinger, Henry; Nixon, Richard. Click here for audio excerpt. Conversation Oval 698-008. 30 March 1972. 5:07pm-5:30pm. Kissinger, Henry and Nixon, Richard. Jonathan Movroydis: Welcome to the Nixon Now Podcast, I’m Jonathan Movroydis. This is brought to you by the Nixon Foundation, we’re broadcasting from the Richard Nixon Presidential Library in Yorba Linda, California. You can follow us on Twitter @NixonFoundation, or at nixonfoundation.org. Today we’re talking the Nixon Tapes again with specific focus on President Nixon’s conversations about diplomacy with the leaders of The Soviet Union. Our guest, again, is Luke Nichter, Professor of History at Texas A&M, Central Texas. He is the nation’s foremost expert on the Nixon White House Tapes and founder of nixontapes.org. Luke, welcome back. Luke Nichter: Thanks, Jonathan, it’s good to be back. Jonathan Movroydis: Much of the Nixon tapes on United States relations with the USSR had to do with the Strategic Arms Limitation Agreement, or SALT. Why was achieving such an agreement important for the United States and for the Soviet Union as well? Luke Nichter: Well, I think it was important for the Nixon Administration because successive presidents and American governments had been trying for years. I mean, arms limitations talks and reduction talks that went back to the middle of the 1950s in the Eisenhower years. I think shortly after, the perception then was after the death of Stalin in late 1953, there was a chance for a new relationship, possibly. So talks began in the 1950s in the middle of the Eisenhower Administration, and they started…there were fits and starts. There was progress made, and then for one reason or another, it always faltered, and a lot of times, it was over inspection issues and verification. So I think we tried it for many, many years under successive Russian and American leaders, and so I think there was a real interest for Nixon to actually be the one to get something done. Jonathan Movroydis: Why all the sudden was there a breakthrough, or why did the Nixon Administration think there would be a breakthrough by the 1970s? Luke Nichter: Well, I mean, there’s a variety of factors. By the early 70s, I guess the most basic answer, although it’s a complicated one, is that the power structure of the world had shifted. I think the U.S. was more willing to make a deal after the long experience of Vietnam. Certainly with the Nixon Doctrine behind it, the idea, as it would be applied to U.S.-Soviet relations is that the U.S. would remain engaged and active in the world, but in the future, it would engaged and active in a much more calculated level. So I think a treaty with the Russians was part of the Nixon Doctrine, I think it fit with the U.S. experience following the long war in Vietnam. I think also that the Russians had learned something, and it had been almost 25 years since the end of the war, World War II, and the cost of an arms race was very expensive for both sides, both the American side and the Russian side, and we had learned that the Russians and the Chinese hadn’t gotten very well along in the 60s, the Chinese themselves were going through a terrible cultural revolution. So I think the experiences of all these nations made Nixon believe the timing was right for a fresh start. Jonathan Movroydis: In Nixon and Kissinger’s mind, did it necessarily mean that the Soviets weren’t going to be adventurous? I mean, for example, the USSR wanted to dominate the Warsaw Pact, they even wanted to dominate China, that’s one of the reasons why they were having such a bad relationship with China is because they had a dispute on their Ussuri River, their eastern border with China. They tried to keep countries ideologically aligned, we see the invasion of Czechoslovakia in 1968. How do you reconcile this desire for better relations with the United States, and vice versa, with Brezhnev’s Doctrine wanting to dominate the Soviet world? Luke Nichter: Well, I think that’s the idea of Detente. I mean, I think Detente is a nuanced-enough concept. In its simplest form, it’s a French word that basically means… It’s a noun that kind of means “a lessening of tensions.” And I think what Nixon and Kissinger realized was that the idea of pursuing some kind of an agreement with the Russians didn’t mean that we didn’t have political differences, we had great differences. I don’t think we were gonna make any progress at all if we were gonna convince the Russians to become capitalists or for them to convince us to be communists. I think Detente was a complicated, nuanced, layered concept that really what we were trying to do is we were trying to learn to live with each other without killing each other. So I think that’s really what the point was. So it wasn’t incompatible that Brezhnev could both, for example, order the invasion of Czechoslovakia in 1968, but also make some kind of an agreement to reduce tensions with the United States. I think for the Soviets, the interest was, and why these ideas were not incompatible, was making an agreement with the arch-enemy was prestigious, it was prestigious for the U.S. and it was prestigious for the Soviet Union, each of whom led a block of countries during the Cold War, or at least various nations looked up to either the Americans or the Russians. So to make an agreement with the other, for these other countries, meant that you were in charge, you were an undisputed leader of your side, or your pact, and it was most of all prestigious, it means you mattered in the world. So even just beyond, you know, we haven’t even talked about the potential substance of any agreement, just the idea that you were important enough to make an agreement with the leader of the other side meant that you were important, you were worth talking to. So I think both for your own side, and for recognition by the other side, there were lots of reasons to at least have the appearance of making an agreement. Jonathan Movroydis: That coexistence, that learning to live with each other and being important, to be the big players in the world, does that accurately reflect the foreign policy “grand strategy” of the Nixon Administration, or was that more of a means to an end? Luke Nichter: Well, I think it changes. I mean, even on the Soviet side, I think on both sides, there’s a continuum of thought, in both the American and in the Soviet governments at any given time, there’s a continuum from those who are more in favor of Detente concepts to those who are really more hardliners. And I think we have all these stories of the Cold War…you know, take the Cuban Missile Crisis where President Kennedy is responding to the Soviet placement of everything from missiles to strategic, tactical and other things, placed directly in Cuba from Soviet ships. And the communications, the cables being received from the Soviet Union to the United States, some have a very hard line, some have a very soft line, and it’s almost inconceivable to think that these could be written by the same person. So I think there’s complexity in the relationship between the two sides, but there’s complexity on each of the sides that evolves over time. So I think for the Nixon Administration, this is someone, President Nixon, who was a foreign policy president. It’s not to say he didn’t have an interest in domestic policy, there are plenty of tapes where he really gets into the weeds on domestic policy. War on Cancer is a good example. But he was always known as a foreign policy president. He was eight years as an Eisenhower’s vice president, another foreign policy president, he ran in 1960 with Henry Cabot Lodge on foreign policy credentials, he ran in 1968 on the same, when a major foreign policy issue, the Vietnam War, kind of defined that year and that campaign. So I think for him, it was only natural that he was gonna try to have some kind of breakthrough in his area of strength, which were subjects that he knew the most about. Jonathan Movroydis: Let’s listen to the first audio, we’re gonna listen to a couple of audios through the course of this podcast, but let’s listen to the first audio of April 23rd, 1971. This is almost a year, or this is more than a year before the summit in 1972. And this is President Nixon, the Chief of Staff of HR, Bob Haldeman, and Dr. Henry Kissinger in the Oval office talking about the possibility of a summit in Russia. President Nixon: Well, let’s look at where we start here, what about the Soviet position? What about the timing? Dr. Kissinger: Well, that we can settle next week. We could complete the exchange of letters within a week. President Nixon: Would be better probably just to exchange letters then to have a press conference. Dr. Kissinger: Now the only point this is, Mr. President, what they want, the only disputed point, they asked about the [inaudible 07:38:50] which I’ll explain to you in a minute, but the disputed point is on the limitation of Moscow against [inaudible 07:39:03] which will drive Scoop Jackson right up a wall. And on the other hand, Dobrynin say that it is almost impossible to explain to their military that we can protect our missiles and they have to protect their population, but I told them, well, they have 500 missiles protected by their Moscow system. Dr. Kissinger: But he denies that. So what I could propose to him on Monday is that they take out that one sentence, which, limit it to that, and that we throw that to the negotiators with the understanding that if they can’t settle it, they’ll just have to yield, if that’s what you want. I think if they freeze their offensive weapons, that’s the big thing. If they freeze their offensive weapons, which they’ve agreed to do, then we can be… Then we can agree to this. If they don’t freeze their offensive weapons, it’s too dangerous. Jonathan Movroydis: That was Nixon, Kissinger and Chief of Staff, Bob Haldeman, on April 28th, 1971. Let’s unpack this conversation a little bit. First, why was an American President visiting Moscow so important to the Soviet Union, as Dr. Kissinger indicated? Luke Nichter: Oh, I think even more than the substance, I think it was image and prestige. I think to have an American President in the Kremlin and to have the image of that broadcast around the world I think was good for the image of the Soviet Union. It also allowed, on the Soviet side and the eastern bloc, for those nations to see that if you wanted to get something done, you went through Moscow, that Moscow is capable of getting something done with the United States that was actually constructive. So I think it was good as a leader of its block, I think Moscow, like the United States, wanted to be seen as not just as a world leader, but a respectable world leader. And when you sat down and made these kinds of agreements, it made you look respectable. So I think image was the most important thing, even more so than the substance of the agreement. Jonathan Movroydis: Let’s talk a little bit about the economics behind the missile systems, Kissinger touches upon this a little bit. He refers to a conversation he had with Soviet ambassador, Anatoly Dobrynin, about protection of U.S. missiles versus on the Russian side, their own population, and about the freezing of Russia’s offensive weapons. Could you take us through what was at stake? What are the general economics regarding our missile systems, and what did the U.S. want to achieve substantively versus the Russians, and what could they come to an agreement on? Luke Nichter: Well, so this conversation is just one of many when… I mean, there might be as many as 50, where Nixon and Kissinger get pretty far into the weeds talking about offensive weapons, defensive weapons, and the types that they like to limit or inspect, or make ultimately a part of this agreement. I think here what you have Henry Kissinger saying, and kind of the key line in that tape segment that you played, is really if they freeze their offensive weapons, which they’ve agreed to do, then we can agree to this. So I think offensive weapons were the things that were scary, those were the things you really wanted to limit. I mean, no Americans, certainly not Nixon and Kissinger on these tapes, ever thought that Americans would use offensive weapons against the Russians. And of course, everyone believes that the other side has a legitimate right to self-defense. So the very concept of defensive weapons wasn’t really threatening. If they were attacked, of course, they could defend themselves. We had no purpose, chance, of using our offensive weapons, so our concern, primarily, is their offensive weapons. Those were the things…that was really the thing that Nixon and Kissinger could use to sell this agreement to congress, that was the key chip to tell the American people, “Look, we finally got a bona fide arms agreement passed,” so I think it was really the focus was on the offensive weapons. I think the Americans were concerned about their cities being struck 4,000 or 5,000 miles away, from Europe, Europeans lived in fear of the Soviet Union, of their cities being hit by Russian missiles. So I think the focus was really on those offensive weapons. Jonathan Movroydis: Again, as we talked on the last podcast, the idea of secrecy comes in to play. There’s a secret channel established between Kissinger and Anatoly Dobrynin early in the administration and Nixon and Kissinger are debating amongst themselves, if there is going to be a summit, that they publish an exchange of letters, and the proper timing of that publication, or even the exchange. What did the Dobrynin channel, firstly, try to accomplish, and why was timing so important, the general idea of timing? Luke Nichter: Yeah, I think the first thing I would say is, you know, I think maybe there’s a little bit too much of an emphasis on secrecy and the so-called back channels that are used during the Nixon Administration. I mean, every administration uses back channels. The idea of a back channel was just simply that you had formal channels and you had informal channels. And a back channel could be as simply as, rather than following exact protocol, maybe your ambassador goes in and talks quietly to a foreign minister of another nation, and there’s all kinds of back channels. Now I think it is true that because Nixon and Kissinger were engaged in so many simultaneous negotiations, in particular with adversaries and even with nations that we had no diplomatic relations, there was a greater emphasis on secrecy and the use of back channels. In the case of Dobrynin, an informal channel, or a back channel, or a secret channel had a number of practical uses. First of all, you could communicate directly, which means you could go around the State Department or you could go around the Pentagon and you could talk directly, you could send a message directly to the Russians and you could receive their direct response. And then by doing that, secondly, you’ve limited…drastically, you’ve limited the number of eyeballs that saw these messages, which reduced the chances of leaks, and it reduced people who really don’t need to know about the substance of these messages ever learning about them. And then I think a third thing is because there are lots of other negotiations going on at this time, with the Chinese, with the Vietnamese, and so it kept things private just between the United States and the Russians at a time when the U.S. was also trying to set up a summit with China. And so a direct channel reduced the amount of time it took to send a message, to receive a response, so I think that there were a number of reasons why having a “direct line,” so to speak, with the Russians was very attractive to the Nixon White House. Jonathan Movroydis: And they’re discussing here a summit in September of 1971. Why didn’t this come to pass? Luke Nichter: Well, that’s complicated. You know, first of all, I think we’ve always gotta realize what we don’t know. There are very few records from the main archive in Moscow, which is attached to the Ministry of Defense, that have been released. It is one of the most secretive archives you can do research at anywhere in the world. It’s very difficult to get in, it’s very difficult to get new records out of them. I’ve tried several times, only with very modest success, to get much of anything out of there, in terms of substance. So there’s a whole another side of this that we don’t know as well as we do our side, and even on our side, a lot of records still have not been declassified yet. But I would say my best guess is the summer of 1971 is really when things took off. In July, Kissinger got a signal from the Chinese that it was gonna be possible for Nixon to visit China, or, you know, within a day to be determined. Nixon made an announcement on live national television on July 15th that he would, in fact, visit China. And so I think that definitely rattled the Soviet a little bit, but I think even leading up to that, they were simply slow to commit. If they had committed, say earlier in 1971 that, “This is the date that we’d like to have the summit in Moscow,” and at least so far the terms had gone well in terms of the arms limitation negotiations, I think probably the Americans would have accepted and said, “Yep, we’ll be there on July 15th,” or August 15, or whenever it was. But as soon as the Soviets detected that the Americans were trying to move more aggressively with China and that there was an opportunity there, then Nixon announced his visit, I think that really caused the Soviets to push off the commitment. Instead, the Soviets made an agreement the middle of August with India, which is a kind of treaty of friendship and amity with India, which at the time was supposed to be a part of the countries that were not aligned with either the Soviet side or the American side. So I think once the opportunity of China moves in there, the Soviets back off. And they do ultimately still commit to a summit and offer a summit in 1972, but I think the primary reason why there wasn’t a Soviet summit in 1971 is because they weren’t able to commit early enough. Jonathan Movroydis: Looking at this counterfactually, do you think if the China initiative didn’t jump ahead of the Soviet desire for a summit, would that have been strategically more beneficial for Soviet leaders? Luke Nichter: That’s fascinating to think about, because I think the records that have been released with the Chinese, show the Chinese really wanted to be number one and wanted to have relationship in their own right, and not just because they were also concerned about what the Soviets were doing. I think the sequence as it turned out created the maximum possible momentum and inertia the way they turned out. You know, if the Russians had gone first, in my view, the impact of the China visit would have been much less. Because one agreement had already been made, the Soviets would already have been posturing as Nixon was on his way to China. I think going to China was just such a shock when it occurred first. It still would have been a big deal had it come after Moscow, but I think doing things the way they ended up provided maximum shock to the world, but also maximum shock to the Soviets and probably end up getting Kissinger and Nixon a better SALT agreement and a better bilateral relationship than they would have had had China come later. Jonathan Movroydis: Kissinger says that the disputed point regarding SALT was on limitation, which would drive Senator Scoop Jackson of Washington, a Democrat from Washington, “right up a wall.” For our audience who don’t know, who is Scoop Jackson, what was his position, and why were Nixon and Kissinger talking about him? Luke Nichter: Well, Scoop Jackson, Scoop was his nickname, he’s Henry Jackson, Henry Scoop Jackson, as you said, a Democrat from Washington. But he was kind of a hardline, a hardliner, against the Nixon White House, against the concept of Detente, and he was a hardliner in a couple ways. He was a hardliner in the sense that he thought that the U.S. was giving up too much to the Soviets and giving it up unnecessarily, that the United States was making the majority of the concessions and we weren’t getting all that much from the Soviet Union. He was a great critic more broadly of Detente, and he was also a critic of SALT, and as Kissinger points out in the conversation, because Jackson really emphasized human rights issues. And in particular, he did not think that Nixon and Kissinger, in the course of negotiations with the Soviets, were pressing the Soviets nearly as much on human rights issues. And by that I mean by getting better terms for better treatment of dissidents within the Soviet Union, more favorable terms for potential immigrants and immigration visas. And particularly later, when you get the Jackson and Jackson-Banic amendments in the mid-70s, the idea of increasing those who want to… the quotas of those who want to leave the Soviet Union voluntarily, in particular emigrants to Israel and Jewish emigrants. So Jackson was a real critic of Detente, not just of Nixon and Kissinger, but all the way through, from Johnson, Nixon, Ford, and even under Carter, of broader Detente issues. And so when Kissinger’s saying that these negotiations will drive Scoop Jackson “right up a wall,” yeah, I think what he was kind of… He was being kind of facetious in a sense, because by that he means anything that suggests the U.S. is either giving something up, or that perhaps the negotiations are actually succeeding and they’re getting something from the Soviets, in this case a limitation, might actually prove Jackson wrong. So Jackson was a reliable critic of Detente, and a kind of conscience and leader among those, Democrats and Republicans, who were critics of Detente, right through the 1970s. Jonathan Movroydis: Let’s listen to the next call a month later, this is May 10th, 1971… Or the next audio. This is Nixon and Kissinger, they are clearly irritated with the leaders of the Soviet Union. President Nixon: Back to the Russians. I think that when he came back, they watched the demonstrations with the rest, you know, the skilled craftsmen working around [inaudible 07:56:44] the Russians [inaudible 07:56:46] and so forth. I think the Russians may be playing a strict political game. President Nixon: If they are, they can’t play with us. Dr. Kissinger: Well, that’s what I mean, Mr. President. I don’t think we should get into a position where we are caught between the doves and the hawks, and where the Russians are whip-sawing us. President Nixon: So how do you avoid that? Dr. Kissinger: Well, what I think, if they… What I would suggest is [inaudible 07:57:16] if they don’t come through with an answer by next Monday. President Nixon: Right, one week. Dr. Kissinger: One week. We tell the Russians, he’s no longer authorized to talk on Berlin except in formal travels. No private meetings with the Russians on Berlin. President Nixon: Do you think that will hurt them? President Nixon: All right, good. Dr. Kissinger: I will stop talking to them about Berlin. Dr. Kissinger: And about anything, until they come with a proposal that comes along. President Nixon: Does Rogers know the Russians have been talking privately? Dr. Kissinger: No. He hasn’t started talking privately yet. Dr. Kissinger: We just authorized it. President Nixon: Oh, oh, I see. Okay. President Nixon: No, he hasn’t talked to them, they haven’t taken up anything with him. Dr. Kissinger: No, they have taken it up, but their ambassador to do it has just arrived. President Nixon: Okay, good, we’ll stop that. President Nixon: “Stop this,” fine. Dr. Kissinger: And we’ll just drag our feet on Berlin. We’ll tell Rogers he should be slow as hell on Berlin. President Nixon: Oh, absolutely. We’re not gonna give them a goddamn thing on Berlin. Dr. Kissinger: Beyond the point which we’ve already given them in [inaudible 07:59:13] because that will encourage them to withdraw. Jonathan Movroydis: That was President Nixon and his National Security Adviser, Dr. Henry Kissinger, on May 10th, 1971. Luke, why do you think Nixon and Kissinger think that we’re being “whip-sawed” by the Soviets? Luke Nichter: Well, there was a couple of things going on. Basically, the idea of being whip-sawed is that you’re being kind of squeezed on both sides. So this conversation segment shows at least two ways the Soviets were doing this. I think the first way was the Soviets were obviously pretty well attuned to Detente’s left-wing critics, but also to its right-wing critics, and they were doing things to irritate both sides, who were then criticizing these negotiations being conducted by Nixon and Kissinger as they were going on. So there was that issue, and then there were also other issues that are being negotiated, such as, he mentions Berlin. 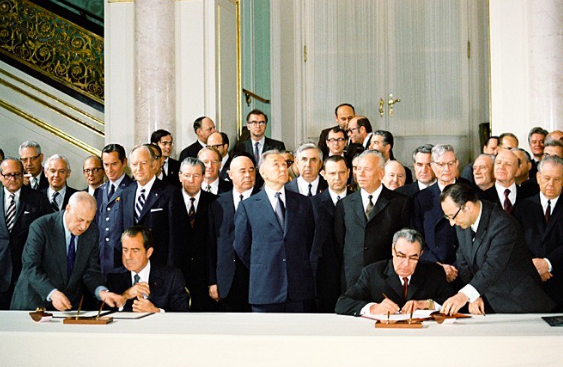 What becomes the Berlin Agreement, or the Quadripartite Agreement, which is signed in September of that year, 1971. So what they’re suggesting here in this conversation is that as the Soviets are starting to slow down and sort of not give us what we want as it comes to what becomes SALT, then well, we’ll slow things down on the Berlin Agreement, which is something that the Soviets want. And so it was kind of this moving back and forth. And then if in one area concessions are made, it’s creating expectations for concessions in other areas, one speeds up, one slows down. And so I think what Nixon and Kissinger are doing in a sense are talking about this concept of linkage that they’re often associated with, which is sort of the various simultaneous negotiations would sort of move forward together, and let’s be aware of what’s happening in one while we’re talking about another. Jonathan Movroydis: Nixon says that the Russians are playing a strict political game, and they don’t want Nixon. Were the Russians hoping to negotiate with a new administration? Luke Nichter: I don’t know, and that’s a good question. This is in 1971, now as we sit today and look back, we see that Nixon won in a historic landslide in 1972. But in 1971, it didn’t look so good for him. His poll ratings were down, at one point in the spring, he says to Kissinger he might not even run in 1972, that he didn’t want to be the second president, the first being Johnson, to be someone who was sort of chased out of office by Vietnam, so things didn’t look so good. So maybe that was a realistic possibility for the Soviets. I remember one time I talked to Sergei Khrushchev, who is Nikita Khrushchev’s son, I think it speaks volumes that he’s decided to emigrate to the United States and live out his remaining years here as opposed to Russia. But he was telling me one time how the Russians were always against Nixon. They were for Kennedy, not Nixon, in 1960, only probably after 1972 did they realize that Nixon was someone they could work with. And I remember he told me, he thought that was a big mistake, including a mistake by his father, he said. Because Nixon turned out, in his words, to be a “pretty good politician,” and I think by that he means someone you could actually work with and negotiate and would keep his word when he made an agreement. So I think the idea of playing a “strict political game,” I think what Nixon’s saying is that the Soviets are not really sincere about getting anything done, they’re just kind of speaking out of both sides of their mouth at the same time. You know, I think maybe they did hope to negotiate with somebody else, I think in 1960, they favored Kennedy, and they said that publicly. In 1968 I think they favored Vice President Hubert Humphrey, the Democratic nominee, and they really didn’t hide their preference there. Jonathan Movroydis: Let’s listen to the next tape, this is on March 30th, 1972. This is a month after the summit with China in February, and this is also right around the spring offensive of the North Vietnamese on the South, and one month before the Soviet summit in May of 1972. So a real critical point. So let me play this right now. President Nixon: We block. I they do, they don’t react. The Russian people are an emotionally strong people. Dr. Kissinger: Yeah. And he said, “Above all, the Russian people, that’s what the Russian people needs, that there’s a solid basis for our relationship, and it’s a tremendous signal to our people to have the President at the Kremlin.” And I think that’s right. Dr. Kissinger: But I think that, if I may make a suggestion, I think we should play it very cool with [inaudible 08:06:02]. We should give the impression that not much is going to happen, and [inaudible 08:06:10]. Because there’s too many ears [inaudible 08:06:14]. Right now no one really expects much out of the Moscow summit [inaudible 08:06:20]. He’s got the thing split up over bureaucracy in such a way, [inaudible 08:06:26]. President Nixon: Well, I think we can play the part [inaudible 08:06:31] a number of things, we’re gonna discuss the subject, but we’re pretty far apart on it, too, we’re pretty far apart. Dr. Kissinger: Yeah. It’s going beautifully on SALT. President Nixon: Is it? But it’s not gonna settle now. Well, the Russians aren’t, right? Dr. Kissinger: No, I told the Premier again today. President Nixon: That’s all we’re gonna get. President Nixon: It’s done, we’ve gotta go to China, too. Dr. Kissinger: I’ve got to go there, too. President Nixon: Incidentally, it’s good to go to China, good to go to Russia, because we’re gonna have to use everybody in the campaign that can be used. You can come back from China and garble around, but [inaudible 08:07:28]. And then after you go to Russia, you can go to the same thing. You see, I want to be… We’ve gotta really throw the big guns in, push our foreign policy up front and center in that period. Dr. Kissinger: China will be scheduled for the end of June, just before the Democratic Convention. Jonathan Movroydis: That was Nixon and Kissinger on March 30th, 1972. Kissinger says in the audio that “Things are going beautifully on SALT.” Why did he feel the United States was getting its way? Luke Nichter: Well, I think when you listen to this particular conversation segment and you compare it to some of the other ones we’ve listened to and some of the other ones that are on the tapes, the tone of their conversation is totally different. I mean, at this point, they’ve got a commitment from China for a summit, and they still wanted an agreement with the Soviets, they wanted a Summit with the Soviets, but the pressure for results is much lower at this point. Once the Chinese take off, the Soviets become more… The relationship with the Chinese takes off, the Soviets become more standoffish, the pressure for the U.S. to achieve something, anything, in the coming year is much lessened because Nixon and Kissinger are fairly confident that things with China are moving forward, so I think they’re much less tensed in the conversation, they’re much less focused on details, they’re talking about the big picture. So I think it’s a dramatic change from just, say, six months earlier. Jonathan Movroydis: Why do Nixon and Kissinger want to, at least in the meantime, to have the matters play out very quietly on SALT? Luke Nichter: Oh, I think at least for a couple reasons that come to mind. It’s no longer the big deal, the news is all about China. And almost anything you do with China makes news, it’s totally new. To keep SALT kind of on the back burner, first of all, it’s highly technical, people don’t understand it as well. It will be more nit-picked, is what Nixon and Kissinger’s view were in terms of what did we really get from this, what did we really lose from this? It just didn’t have the level of excitement, it didn’t have the psychological shift that the new relationship with China had, so I think they kind of moved SALT to the back burner thinking, “Well, it’ll happen.” And even if it doesn’t, or doesn’t for a while, we’re really focused on China right now. So I think it just becomes a priority, but it no longer has to be the number one priority for the Nixon White House because they’ve got other things to work on. Jonathan Movroydis: Nixon and Kissinger talk about the value of Russia and China in the campaign, especially the optics, the playing out of these trips on television. The Vietnam War was winding down at this period. Still raging, but winding down. Our troop levels kept going down, the end of the draft was near. Why did they think that foreign policy would be so valuable to be front and center in the 1972 presidential campaign? Luke Nichter: Well, I think once Nixon and Kissinger knew the China summit was gonna be scheduled, even before they knew when it was, I think that caused an enormous shift in policy and in American politics. It’s funny hearing Kissinger talk about his hope that the summit with China would be scheduled in June of 1972, just before the Democratic Convention, obviously with an eye toward dominating the news as opposed to letting Democrats dominate the news. I think that in a way shows us, as we listen to this today, that Nixon and Kissinger, they’re at their limits. And even they, at their level, don’t call all the shots, the Chinese have a say here too in terms of how this all unfolds. But I think the tapes, later in 1972, between Nixon and Kissinger, they refer to it as three for three, that that was the focus, the three major foreign policy negotiations: To end the Vietnam War, Detente with the Soviets, and as it was called, Reproshma [SP] a new relationship with China, were the three major things that were all being worked on simultaneously in 1972. And it was the scheduling of one of them, the Chinese summit, even before Nixon ever stepped foot in Beijing, that caused the shift. They believed both in the negotiations to end the war, but also with the Soviets, it was that first one of what became the three for three, the Chinese Summit provided the opportunity for this tremendous breakthrough year, which also happened to be presidential election year, which also happened to be all issues that played to Nixon’s strengths, which would of course allow him to dominate the news and would allow him to, while looking like a great world leader, would make him look like a great national leader just before Americans went to the polls. Jonathan Movroydis: Our guest today is Luke Nichter, Professor of History at Texas A&M University, Central Texas. Our topic was “The Nixon White House Taping System as it Pertains to United States Relations with the USSR in the Nixon Era.” Luke, thank you so much for joining us.